The AP260 5-stage air purifier is an innovation in air quality technology designed to remove pollutants from your air ranging in size from large particles down to airborne bacteria, harmful gases and unwanted odors for spaces up to 260 square feet. 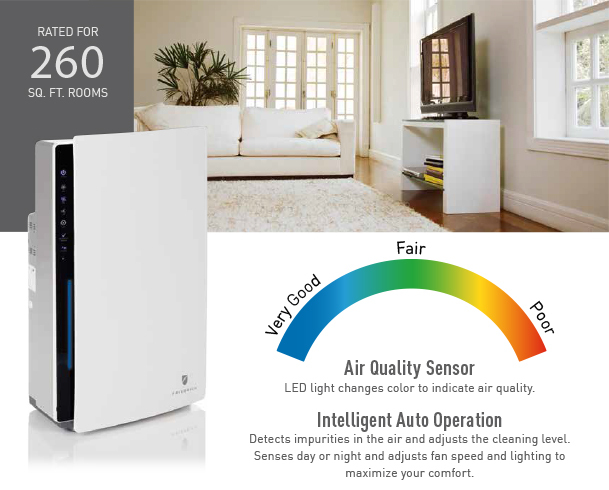 With Intelligent Auto Operation, it automatically adjusts its cleaning level to sense changes in air quality and indicates your air quality status through a unique colored LED display. It’s modern, efficient and convenient and the perfect solution for allergy-sufferers, pet owners or anyone wanting clean and healthy air in their home.